For our discussion I will lump everything under “fast heart rate” to keep things simple. That includes everything: palpitations, tachycardia, AF and so on. So, for example, if someone starts smoking pot, and they develop “palpitations” or they feel their heart racing, AF MAY be one of the causes of a fast heart rate, but it will not be the most common cause by any means. In other words AF appears to be a rare but serious adverse effect from the ingestion of cannabis. How serious? How rare? It’s pretty serious and we hope, rare. The authors searched the EMBASE AND MEDLINE databases for key words related to our discussion. They found six cases for analysis, only six out of thousands of entries. That’s the good news but the true incidence may be much higher. We simply do not know yet. Of the six, five required IV pharmacologic intervention to convert AF back to normal sinus rhythm which is pretty disconcerting. None of the cases lasted long, and none of the patients had any serious outcomes other than a syncopal episode (fainting) in two of the patients[ref]Int J Clin Pract. 2008;62(2):308-313[/ref]. The authors continue: Compelling evidence is accumulating that cannabis has significant haemodynamic and electrophysiological effects on the cardiovascular system… mediated mainly by Δ9-tetrahydrocannabinol (THC), although other substances may also be implicated. These effects include a marked increase in heart rate, lesser increases in supine blood pressure and frequent occurrence of postural hypotension…On the one hand, these effects seem to be dose dependent, but on the other hand, the frequent use over a relatively short period of time results in tolerance. In the last sentence, tolerance means that the more you smoke the less of an effect you will see as far as tachycardia and postural hypotension goes. Therefore, someone like Willie Nelson probably doesn’t experience ANY tachycardia and hasn’t in 50 years. That’s good news because it tells us that if you don’t experience a tachycardia in your formative years as a budding stoner then you, in all probability, never will. I think this applies to the development of AF as well; once you go chronic, as long as your heart and lungs are in good repair it should not be a problem. So listen up. The greatest threat is to a novice marijuana smoker (or eater) who experiences the greatest activation of his or her virgin sympathetic nervous system. This can only occur before the vasomotor center (in the brainstem) can “accommodate” to the higher THC levels that frequent users have. Once achieved, it produces a dampening of the brainstem’s sympathetic output, and effectively prevents a tachycardia from developing. This refers to ANY tachycardia including AF (see adrenergic stimulation top left of figure one). This is one case where MORE IS BETTER. 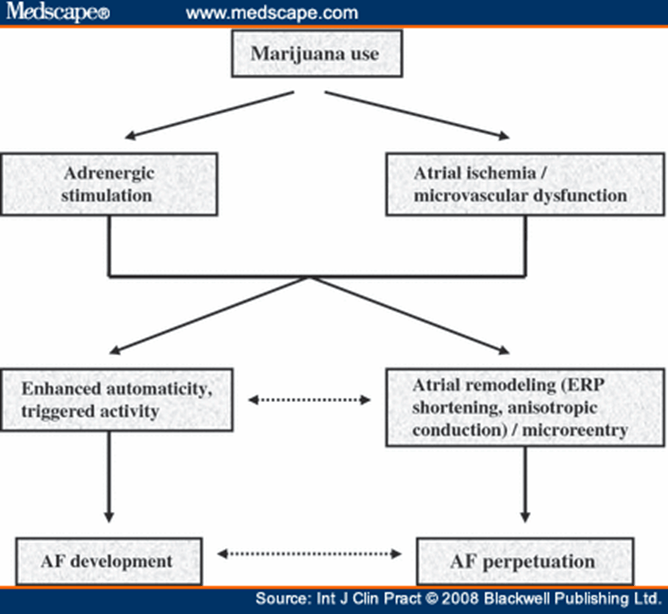 Proposed pathogenesis of marijuana-induced atrial fibrillation. AF, atrial fibrillation; ERP, effective refractory period[ref]IBID[/ref]. From above you can see the author’s proposed model that helps to explain how AF could develop in a marijuana user. AF is a serious disorder which needs prompt medical attention. To confuse the issue, which is what medicine is all about, many users may in fact be experiencing transient episodes of AF and never know it. But the exact incidence of this disorder is completely unknown at this time. Frequent cannabis users report “palpitations” on numerous occasions but they could be due to sinus tachycardia, AF, PVCs (premature ventricular contractions see section three), or some other as yet to be described dysrhythmia. The authors also state that the euphoria from marijuana may mask the disconcerting events going on in your chest. Lastly, since pot is still a “dangerous and illicit substance of abuse” many people who might experience a real episode of AF or multiple PVCs may never see a doctor out of fear. I personally know that this was the case when I was living in Santa Cruz, CA. Here many chronic users came to the Chinese medical clinic for acupuncture knowing they would receive a more sympathetic ear to tell their tales of palpitations. Now, if you do indeed experience a racing heart rate the first thing to do is get the rate by feeling your pulse on the radial artery on the wrist. Measure it for 60 seconds. That will be your heart rate-simple right? The normal range of heart rate is about 75 give or take 10 beats on either side. But smoking marijuana clearly increases your heart rate so it might be closer to 100 or more in the apprentice pot smoker. This is called sinus tachycardia and it’s essentially benign. The only problem is that you cannot tell what type it is unless you have an EKG (ECG for you newbies) handy. Interestingly, should your dog get into the brownies he or she will experience bradycardia (a slow heart rate), not tachycardia. Or you may be having palpitations. The true definition of palpitations is an uncomfortable awareness of your heart (beating). It’s not a true medical term anymore. You may also experience occasional extra beats (premature ventricular contractions, PVCs, ectopy) where you feel your heart flip-flopping; this is what patients often times erroneously call palpitations, but it’s so common that I use the terms interchangeably. Some patients with AF may report having palpitations too. The impact of marijuana smoking on clinical arrhythmias has not been well studied. Palpitations are commonly experienced after marijuana smoking and are usually ascribed to the sinus tachycardia or more rarely to premature ventricular contractions… Petronis and Anthony, in a large epidemiological study, clearly showed that marijuana smoking is independently associated with increased incidence of palpitations, although the underlying cause of this finding was not clarified[ref]Int J Clin Pract. 2008;62(2):308-313[/ref]. Interestingly, case reports describing a temporal association between marijuana use and ventricular arrhythmias often implicate myocardial ischaemia as the underlying cause [ref](Int J Cardiol 2005; 104: 230-2. Ann Emerg Med 2003; 42: 365-9)[/ref]. But that would be exceedingly rare, and it most likely would happen to those with known cardiovascular disease. In conclusion, there are several fast heart rates (sinus tachycardia or AF) and strange sensations (PVCs, palpitations) that marijuana users report usually within the first 90 min of partaking in the cannabis experience. Normally this is of no consequence in young, healthy persons with the exception of AF. Because of the dangers inherent in AF, do not simply assume that your racing heart is of no consequence, that’s called denial. Should the rate be excessively fast (over 125), sustained for over one hour, or you experience chest pain, lightheadedness, nausea or vomiting it may be signs of something much more serious. Under those circumstances, the most prudent thing to do is to visit your friendly neighborhood emergency department just to be on the safe side. There they can quickly administer an EKG and “see” what type of cardiac problem you are experiencing. Aside from the fleecing you will receive on your pocketbook (US only of course, not the UK), you will at least be able to sleep that night knowing that you are not one of the few suffering from this dangerous disorder called AF. Please be aware that the term AF in the above article stands for ATRIAL FIBRILLATION, a dangerously fast heart rate. I have permenent afib. meaning 100% if the time. I have had it for 15 years. I had a cardiio ablation. I had not smoked marijuana since I was in my about 30 years old. anyhow I believe marijuana will prove to benefit people with diabetes, pain from neuropathy and afib. just my opinion. Legalize recreational Marijuana in the USA. I have AF and been electroshocked 5 times over the last 20 years. I am about to start taking “capsules” of cannabis extract. I am 87 years old. I just like to have a good night’s sleep and relief from all the aches and pains associated with old age. A very incoherent piece of writing littered with factual errors and inconsistencies. Actually, its possible that some Afib patients can have a fairly slow heart beat–I know a guy who seldom goes over 80bpm but is in constant Afib. There’s some serious fact checking to be done here….Afib is not a “dangerously fast heart rate.” It is a form of irregular heartbeat.